Apple’s App Store has a flaw in its updating process that is causing some programs to crash when they're launched, according to a developer. Marco Arment, the developer of Instapaper, noticed the problem Wednesday after being inundated by user complaints about his app crashing on launch after users upgraded to its latest version. "This didn’t make sense -- obviously, Apple had reviewed it, and it worked for them," he wrote in his blog. "My submitted archive from Xcode worked perfectly. But every time I downloaded the update from the App Store, clean or not, it crashed instantly." After some research, Arment discovered that the update Apple was pushing to his users was corrupt, he said. After making some noise to Apple through e-mail and the public on Twitter, he said the problem was fixed and functional updates of his program began flowing to his customers. Apple has not commented on the incident. Arment wasn't alone in his problem. He identified more than 50 other apps with upgrades that exhibited buggy behavior, including Angry Birds Space HD Free and GoodReader. In a message to its users, GoodReader attributed the App Store problem to damaged binaries caused by changes Apple made to its app distribution engine. It also noted that the problem was affecting multiple updates of its app. Both updates to versions 3.15.0 and 3.16.0 were affected by the bug, it said. The corrupt binaries appeared to be occurring only in downloads from the App Store app resident on the iPad, and not from files downloaded from iTunes on a computer, GoodReader added. 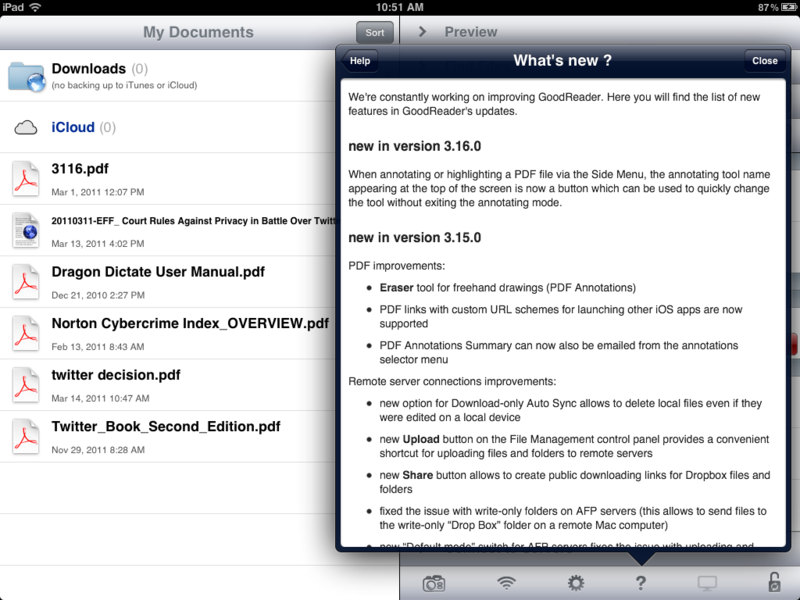 Apple appears to have fixed the problems with GoodReader. I have downloaded both the 3.15.0 and 3.16.0 updates to my first-generation iPad, and they are functioning normally. Needless to say, the glitch ruined the Fourth of July holiday for some developers. "We are still getting those issues with our Scanner Pro," commented Denys Zhadanov, marketing manager for the company that makes the app, Readdle, of Odessa in the Ukraine. "Thanks Apple for ruining a big launch, since it was quite important update with iCloud sync."